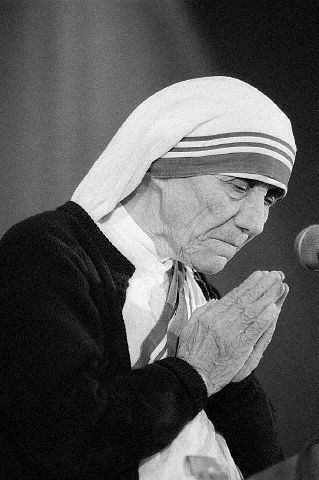 Mother Teresa, who dedicated a major part of her life to serve the poor and destitute, was the founder of the Missionaries of Charity in Calcutta, India. She received numerous awards, including the Nobel Peace Prize in 1979 and, after her death in 1997, she was beatified. 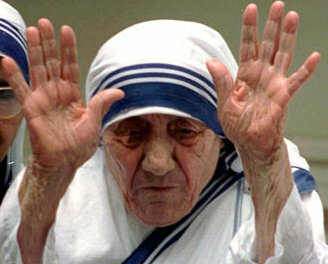 The most striking feature of Mother Teresa’s hands is the extreme flexibility of her thumbs. Her “bending-over-backward” thumbs make her open, spontaneous, child-like and easygoing, the type of person who can “smell the roses” along the way and adapt to any situation. To balance this flexibility, we can see, on both hands, a destiny line crossing the whole palm straight up from the hand bottom to the middle finger – it almost looks like it continues on the fingers! This conveys more than one aspect of her personality. The origin of the line at the bottom of the palm shows that Mother Teresa was focused and driven from her early years, and that nothing could sway her away from her course. The top part of the line, crossing the mount of Saturn and becoming a "Love of Truth" line, indicates that her resolve is not based on her mind or her emotions, but anchored on a much more powerful spiritual belief. This is noteworthy considering that she was ridden by doubts about God. In “Come Be My Light”, a compilation of her correspondence, she wrote that, for the last 50 years of her life, she felt no presence of God whatsoever. However, she never left this fact affect her belief in her work. The Love of Truth line also makes her receptive to others’ points of view and she is willing to accept criticism because she can see beyond the observable reality. For an older lady, her mounts of Venus and Luna, at the bottom of the palm, are surprisingly prominent. Those mounts provide her with a clear perception of the way life really is (Luna) and an awareness of her physical needs (Venus). 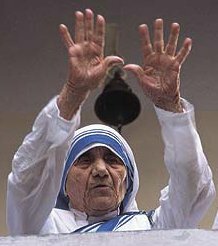 Another interesting feature is the width-and-length ratio of Mother Teresa’s hands. If you calculate the width of her palm, it is roughly equal to the length of her middle finger. The length gives us the required discrimination, wisdom and discipline to set our goals, while the width provides us with the energy, the sense of control and the nervous system necessary to put our thinking into action. When length and width are equal, we think and then we act, without letting anything stop us. Finally, the length of the ring finger compared to the index finger is what you would expect from any celebrity. The longer ring finger reveals Mother Teresa’s incredible charisma and power of attraction. Apparently, Mother Teresa always carried a large bag with her where she stuffed all the money that everyone was always ready to give her! While she never kept this money for herself, it never stopped coming. Her index finger, which is not as long as her ring finger, is still of a respectable length, showing a sense of purpose and ambition which, in her case, is not associated with self-importance or arrogance. In summary, as can be expected, those hands show a charismatic personality with an unshakable sense of purpose from early in life, but balanced by considerable flexibility. Those qualities allowed Mother Teresa to make a tremendous difference in the world and to leave a legacy that will keep inspiring humanity for many years to come.